BRAND NEW AND HOT OFF THE PRESS! 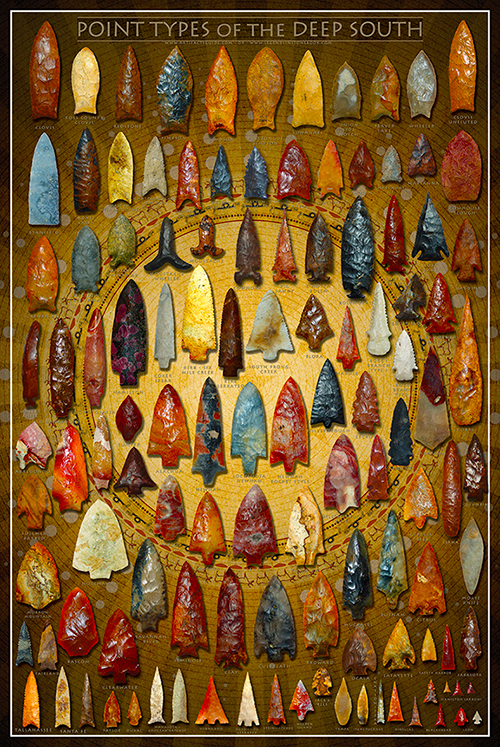 Featuring over 100 different point types from Paleo to Mississippian times, found in the Deep South. Full color and measures 24 inches wide by 36 inches tall amd has some of the finest and classic examples along with their respective names for each type, many shown actual size. The photos do NOT do this one justice and would make a perfect gift for the collector that has "everything" but easy on the pocketbook. Looks great framed and in your rock room, office, or lobby. Excellent conversation starter. Priority shipping is $8.95 in a shipping tube.